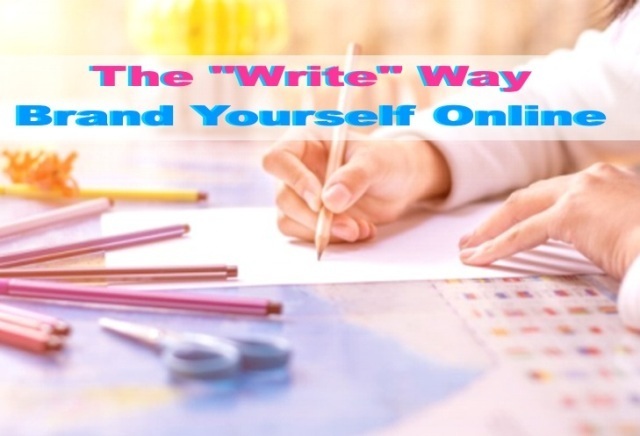 The Write Way Brand Yourself Online - One simple truth overlooked in most training programs is this: You can only brand yourself in your own words. The notion of duplicity has led to a copy, cut and paste mentality. This mentality makes many try to brand themselves in the words of others. But using others' copy, in all your Internet media can only brand you as a clone. What's wrong with that? If you are branding yourself as a clone, it becomes obvious that you are following someone else's lead. So who winds up with the loyal following? Your mentors not you! Most people lack confidence in their writing skills only because their previous training in writing was geared toward academic writing. But, successful writing in advertising and all on line communications is conversational not academic. If you can carry on a conversation you have the basic skills to write the things you need to brand yourself on line. Branding is really and exercise in finding like minded people to follow you. So what you think, your perspective is what they want to know and will trust. What do You Need to Learn to "write" Your Way to a Successful Brand? 1. The first thing is to understand the different media you are using. Learn the etiquette of those media so you don't wind up abusing the media or your audience. Each of these media, lend themselves to differing lengths and content use. You can't tweet a white paper, so don't try it. Understanding how your media naturally connects from initial contact to creating a loyal follower will help make your efforts more seamless for you and your readers. We live in a lol, brb world of abbreviations and text messages, but many marketers still use a very long form of writing that was successful for copy writers who focused on direct mailers. It is probably not coincidental that these copy writers got paid by the number of words. This style doesn't match up with the media or the decade. People just don't have time for it. So why waste your time and theirs on lengthy emails that will at best get scanned,but usually just go straight to the trash bin. 2. To develop a relationship with potential customers, you must take advantage of the "give and take" forms of media to get to know them while they get to know you. Never forget that a relationship requires the participation of two parties. And as it is any where else in life one sided conversations rarely lead to lasting relationships. It only stands to reason that the more you know about someone the easier it is to be able to focus on the things about your products that would interest them. 3.Your writing style should be conversational, simple, minimal and to the point. This is not to say that you shouldn't use more expansive forms in articles. Not all articles need to be as Sgt Friday would have said, "just the facts, Mame." Articles can and should inform, but you may choose to tell a story or use humor to make a point. Using storytelling and humor, can make what you write more enjoyable for the reader. Information presented in enjoyable ways can do a lot in making your brand stand out. 4. Never take or imply credit for something you didn't do. Unless of course your in an ad for "Windows 7". Writing simply doesn't offend the intelligence of your readers, but pretending to be something you are not will. When you copy emails for example, you must realize that if people are seeing that email through a safe list the likely hood of seeing the exact same email from someone else is an odds on winner. So what does the reader think when he gets six emails from people that all start with: "My friend John Doe has put together this AWESOME program that will EXPLODE your business and it's FREE!"? Do the words, "hum just another copy cat program" come to mind? Or I wonder if any of these people actually know John Doe? If someone impresses you, say so. Tell the reader why. Then quote that person where applicable. When you do this people who respond to the quote the same way you just expressed will follow you because the identify with your take on what the person said. 5. Learn to write in your comfort zone. If you are an analytical person, analyze and share your analysis. If you are a story teller, make your point and present information through stories. If you just consider yourself an average Joe with no particular skills for writing, just tell people what you think. 6. Keep your copy fresh. Don't fall into the trap of black and white one dimensional thinking. You can always test your copy and your headlines so try different things. Don't get lulled into thinking there is only one way to format an email. Many programs will tell you to always write your emails formatted for margins the same way. And often they say this based on some research. But the problem becomes that when people get an email formatted in a way that is different from the way friends would write and email, they begin to recognize this formatting style as a "sales letter." This can be a deterrent and they may not read it. Learning more about these basic areas, will make your brand stand out. And before you know it the writing tasks you used to dread will be something you enjoy. Remember to understand and use media correctly, converse through the media, keep it simple, stay in your comfort zone, use your own words and try new approaches and tweaks. Have fun writing your way to a successful brand! 0 Response to "The "Write" Way Brand Yourself Online"